With a mousepad, cut, copy, and paste YOU can draw too! It appears that another optometrist with an actual art degree has been making comics for years and now has a book out. Review of Optometry even did a profile on Dr. Scott Lee, O.D. I’ll bet he even draws them on paper instead of using a mouse in Paint.net. Well, I see I shall have to get my game on to compete. But there is one thing Dr. Lee doesn’t have: seafoam green backgrounds. Yup, that was my idea. I also now have Optoblog poetry, so I’m really diversifying my portfolio which will pay big dividends when I cash in on my book deal. 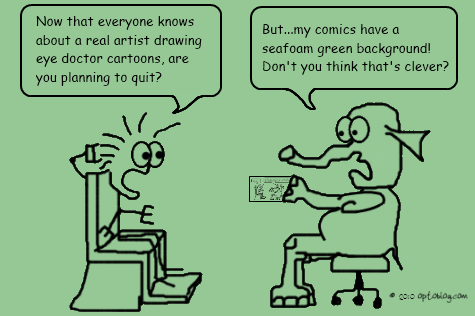 Be sure to stay tuned to my Optoblog comics. They’re just for optometrists. Patients won’t get them, but you will. Feel free to use them in your C.E. presentations. Send me a cell phone photo when you do!